Federal Reserve headquarters in Washington DC. [Updated at 2:22 p.m ET] The Federal Reserve meeting is over. The Fed has decided not to begin a new round of quantitative easing. However, they say they remain open to further economic stimulus if the economy continues to slow. 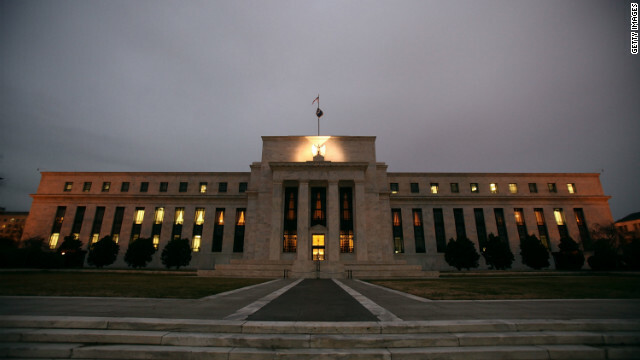 (CNN) – This week leaders of the Federal Reserve will gather in Washington DC for its regularly scheduled contemplation of US monetary policy. As the economy continues to do its convincing impression of a three-toed sloth, many Fed-watchers think the central bank could decide that the system needs more stimulation. Among the possible measures the Fed could take (on top of programs already in place) is another round of quantitative easing. This means that the Fed would increase the money supply in the hopes that the economy would stir. To do that, it needs to create more money. Don't expect to receive an envelope in the mail stuffed with cash. [1:36] "It means that the Federal Reserve is buying Treasury securities,"
[3:14] "The bank has a check from the Fed. And basically the bank then puts each check on deposit at the Federal Reserve. The Federal Reserve is a bank, a bank for banks. And the Federal Reserve creates money, creates bank money, by buying Treasury securities, by issuing a check on itself." The Federal Reserve meets this Tuesday and Wednesday (7/31 and 8/1). We should find out what course of action the Fed has decided on shortly after the meeting ends. Hi, i think that i saw you visited my blog so i came to return the favor?.I'm trying to find things to enhance my web site!I suppose its good enough to make use of a few of your ideas!! The Fed flooding the banks with money would help the economy if it could be sure that it would lead to an increase in the banks creating more loans, however because of the current state of the economy,banks are likely to just hold onto that money for fear of becoming insolvent and failing. If the banks hold onto the money this will not increase the money supply, rendering quantitative easing ineffective. So, while flooding the banks with money can be an effective tool to increase the money supply, it can also be extremely ineffective if entities like the banks or the American people do not act the way the Fed anticipated. Wrong. There is no benefit whatsoever by flooding the currency pool with more phony money that has been conjured up out of thin air. When gold was the money standard, there was a fixed amount of it. The banks couldn't create more gold. That's why they conspired to take us off the gold standard, so they could print and lend phony money. In the end, each time they inject money into the pool, they dilute the spending power of the total amount, like flooding a cup of milk with 50 gallons of water. Or consider the orange supply; if oranges were used as money, and the supply of oranges magically increased one thousand fold, guess what value oranges would have? Same thing happens with our money, thanks to the Fed and the US Treasury. They are colluding. By increasing bank reserves, the FED can improve a banks capacity to provide loans. However, the money supply need not necessarily increase. Consumer confidence is still low. It is also difficult to identify the exact amount of stimulus needed to boost the economy. An oversight or miscalculation could lead to consequent injections that will add to further complications. I also agree with DJ Nam on asymmetrical information being a potential barrier to the FED's success. Technically, increasing in money supply in the market(banks have more reserve) should banks have more capacity to loan out to their clients. That makes businesses and individual clients,supposedly, expand their investment and consumption. More investment and consumption should revive the US economy. However, there is one thing that I worry about and the Fed should not ignore. No matter what kind of policy the Fed would use, if they cannot make the US citizens understand what the Fed is trying to do, then the policies are impotent. According to the USA today report that was posted on January 8th, 2009, one out of seven US adult can comprehend English. The Fed is increasing the money supply in the market and expecting those illiterate people(consumers) to react what the Fed is trying to.So, I do not think, this policy will not work at all. Thus, I would suggest the US to think about how this country has started; this country has built upon the idea of "for the people, by the people, of the people," Unfortunately, seems like the US is "for the money, by the bank, of the policy." I really hope that the Fed must not forget that the economy works when the banks, the government, and the citizens work altogether for the same goal. I agree with lex green. Jaun Ganem represents the "illiterate" that DJ was speaking of. Just cause the Fed "makes money out of thin air" doesn't mean that the money is not valuable. And like lex green pointed out, inflation hasn't been a problem in the past two decades and probably won't be that big of problem in the near future. Everyone is right that the Fed increasing the money supply won't really spark the growth we need. But what would the alternative be, just sit around and say, oh well I can't solve the whole problem, so I won't try at all. The Fed is doing the best it can. It's policies are very limited. So while we should by no means consider this policy the end all be all, but we should definitely do it. Like DJ said, everyone needs to do their part. I hate to be technical but I think otherwise the article is misleading. The Fed is increasing banking system reserves. That increases the capacity of banks to make loans. It's when the loans are made that the money supply increases. When the amount of bank credit expands the money supply increases; when folks pay off their bank loans the money supply contract– that's econ 101. The caveat is that banks are not converting the increased reserves into loans– that's what would cause the money supply to increase. Sooooooo.- the Fed's easing right now has pretty much the same effect as a discount rate decrease..... the bottom line is that until incomes and aggregate demand increases the bank won't have a lot of customers lining up to take out loans. And what's the alternative.... make it *harder* for banks to make loans?